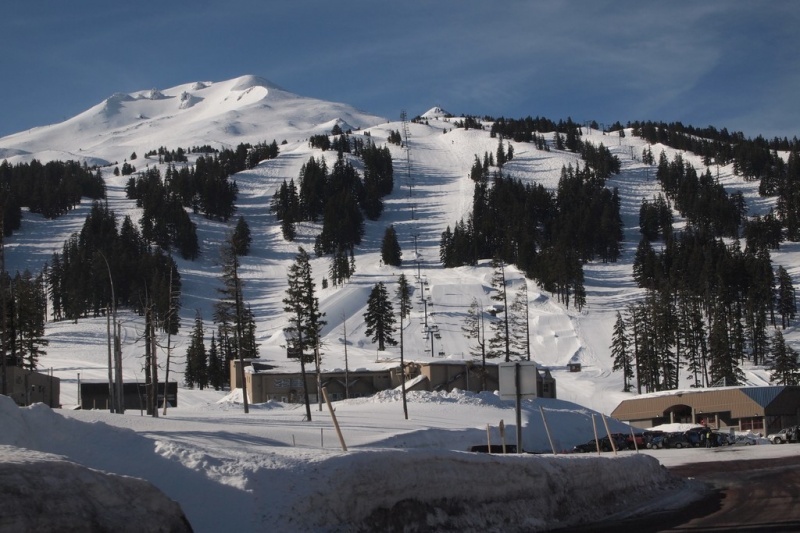 Bend, OR – With over 3,000 skiable acres, 10 chairlifts (seven of which are high-speed detachable quads) and a vertical drop of 3,365 feet that follows all 360 degrees of a volcanic cone, Oregon’s Mount Bachelor is one of America’s largest ski resorts. By all rights it should be a world-class ski and snowboard destination, but thanks largely to a total absence of slopeside accommodation it’s little known to visitors outside of the Pacific Northwest. In a classic example of making lemonade out of lemons, Mount Bachelor officials are trying to transform that liability into an asset. Recognizing that not all skiers are in search of a vacation in a posh base village brimming with condos, restaurants, boutiques and discos, Mount Bachelor’s marketing plan uses rustic imagery reminiscent of America’s National Parks to convey a wilderness experience, and instead leverages the vibrant nearby town of Bend to provide off-mountain amenities for destination visitors. “We don’t have that stuff, we probably never will, and we’re pretty darned proud of that,” the ski resort’s marketing director, Andy Goggins, says of slopeside lodging, or more accurately Bachelor’s lack thereof. The resort is built entirely on National Forest Land without private holdings to swap for valuable real estate at the base. 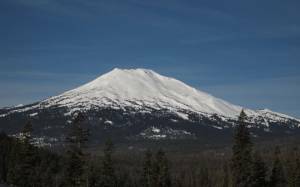 In addition to the forest plan for the Deschutes National Forest within which the resort operates, there’s also an encompassing Northwest Forest Plan that provides an overall vision for the Pacific Northwest and contains a clause that specifically prohibits overnight accommodations at Mount Bachelor. And that’s pretty much always been the plan. Once a thriving timber mill town, some of Bend’s earliest residents were Scandinavian mill workers pining for a place to ski. After forming the Skyliners Ski Club in 1927, club members regularly held a ski race on the mountain known at the time as Bachelor Butte, but built lifts on a smaller site closer to town. After their rope tow and out-building burned in 1957, a group of local business people including World War II 10th Mountain Division veteran Bill Healy convinced the U.S. Forest Service to let them build lifts and cut trails in the Deschutes National Forest on Bachelor Butte. Shares of stock were sold for $25 to the local community and a winter-accessible road was constructed to the base of the mountain. The ski area first opened on December 18, 1958. Operating that initial winter with a poma lift and two rope tows only on weekends, it turned a profit in its first year. As the resort expanded in subsequent years to include chairlifts and additional terrain, U.S. Geodetic Survey maps officially changed the name of the mountain from Bachelor Butte to Mt. 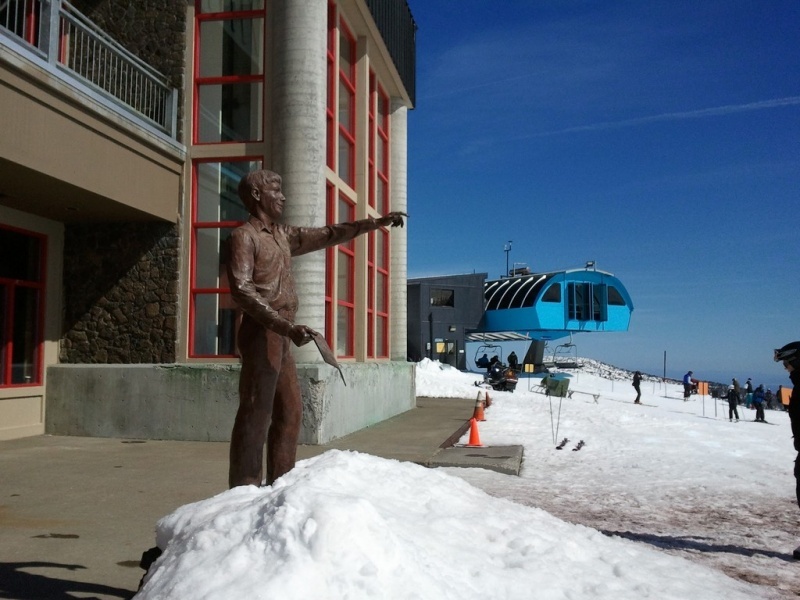 Bachelor in 1983 after a tireless and persistent Healy successfully convinced the Oregon legislature to pass a bill into law to change the name, the same year that Bachelor’s lifts reached the mountain’s summit for the very first time. The resort has since been sold to Utah’s Powdr Corp, operator of ski resorts as diverse as Park City Mountain, Las Vegas Ski & Snowboard Resort, and Killington in Vermont. While capital expenditures have focused in recent years on maintaining Bachelor’s infrastructure, a door is opening for the resort’s first significant terrain expansion since 1996. On a warm spring day in early March, GoNomad.com travel editor Max Hartshorne and I strolled the streets of Bend in shirt sleeves in search of a tasty bite for lunch. Nineteen miles and some 5,000 feet in elevation away, Bend locals were enjoying a powder day. 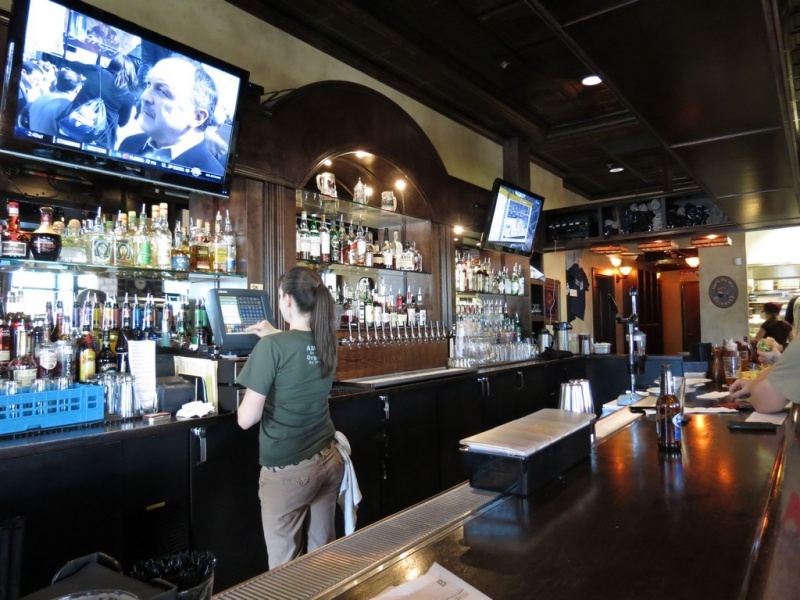 Out of numerous attractive choices we settled upon Brother Jon’s Public House, an inviting tavern with no fewer than 10 local beers on tap. A scrumptious Coho salmon sandwich served by an affable bartender relieved the hunger pangs from travel and held us over until après-ski. The barkeep was more than happy to answer questions about life in Bend. 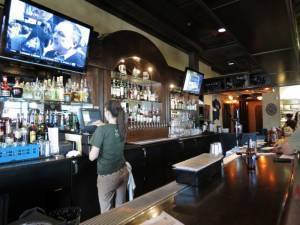 With a dozen craft breweries in town and more on the way, the choices for après-ski in Bend are nearly limitless. The problem was that we hadn’t yet skied, a situation accentuated by a number of local skiers with whom we threw back pints later that afternoon at Cascade Lakes Brewery. New England Patriots Hall of Famer, Bend resident and Healy’s son-in-law, Drew Bledsoe, Skjersaa’s Ski Shop proprietor Jeremy Nelson, Cascade Lakes owner Chris Justema and friends all spent the day carving powder turns on the mountain before warm spring air moved in to turn it all to mush. It was the stereotypical case of “you should’ve been here yesterday,” and they all made sure to rub it in. We were undeterred. Spring skiing can be nearly as much fun as powder, and we had a huge mountain to explore. A hill the size of Bachelor can reveal secrets for days on end. 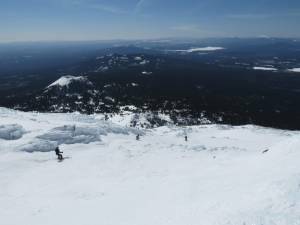 Visitors from Portland, some three hours distant, bypass the wetter snow on nearby Mount Hood to flow into Bend on the weekends, leaving Bachelor’s slopes relatively empty midweek. I boarded the Pine Marten Express with Tom Lomax, Mount Bachelor’s Operations Director, for some early morning turns an hour before the mountain opened to the public. This lower mountain terrain in front of the West Village base area is largely intermediate in nature, and Bachelor’s morning corduroy was impeccable. The warmup the day before was hardly noticeable as we screamed down the hill in huge, fast arcs across the dry and chalky snow. Bachelor sits east of the Cascade crest and as such avoids the “Cascade Concrete” commonly found elsewhere in the region. An annual average snowfall of 387 inches ensures ample cover and our visit coincided with a season in which Bachelor escaped the radically decreased snowfall plaguing other regions of the U.S. While we had the runs to ourselves until 9 a.m. there was little detectable change once the lifts officially opened. Bachelor midweek affords ample elbow room. 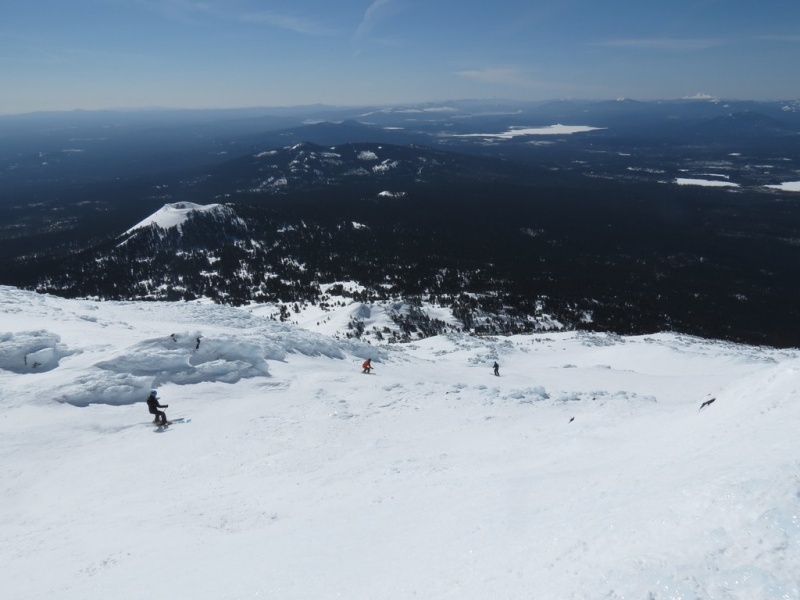 Mount Bachelor’s marquee terrain, however, sits above its 7,500-foot treeline on the mountain’s summit cone. Pitch gradually increases with elevation but there’s nothing here that’s steep enough to give a true expert pause. Bachelor’s distinct advantage lies instead in its unique topography. With the Summit Express lift ascending to the mountain’s pointed 9,065-foot top, the highest lift-served elevation in the Cascades, skiers can head in any direction on the compass rose to take advantage of every aspect, finding the best snow available after both the sun and wind have had their way with it. And the central Oregon wind often does. Bachelor’s summit is frequently afflicted by stiff breezes, rendering the Summit Express inoperable some two-thirds of the time. Thick rime coats lift equipment in ice so thick that staffers sometimes have to blast it free with dynamite, and trees are transformed into solitary snow ghosts. That’s when experts migrate to the more sheltered Northwest Express, which at 2,365 feet has the highest vertical drop of any lift on the mountain. Starting below the resort’s main base at 5,700 feet and rising to just above the tree line, the narrow runs off Northwest Express dip and tumble down the fall line in a way reminiscent of classic New England skiing. The widely spaced giant lodgepole pine and mountain hemlock trees, though, produce top quality tree skiing that New England resorts could only dream of. We were lucky. 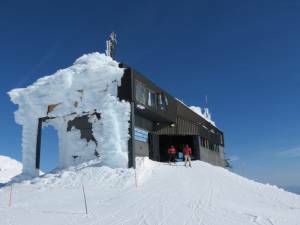 Although winds gusted to 60 mph and higher during our visit, Summit Express operated for two of our three ski days to double the average, and clear skies afforded vistas that reached past the Three Sisters and other Cascade volcanoes stretching off to the horizon. It was the perfect time to explore Bachelor’s famed Backside. There are no lifts on Bachelor’s west-facing Backside. Instead, a four-mile “catch line” carries skiers and riders back to the front side lifts. With a pitch sufficient to carry snowboarders at speed this cat track heads in two directions from a height of land that divides the east and west catch lines. A plethora of signs on what seems like every tree ensures that visitors don’t ski into the wilderness beyond. Lava flows from the volcano’s early years create a series of shallow canyons running down the fall line. Even though the mountain hasn’t been seismically active for 8,000 years, these flows have created a unique terrain playground of ridges and gullies, and a skier can traverse from one to another to find the best snow. The Cascade Lakes wilderness stretches in a series of lakes and forests beyond the volcanic crater of nearby Tot Mountain. The big-mountain feeling of remoteness is second to none. It’s a far cry from the lower runs of the mountain’s front side. Here, gentle slopes rise above a second base area anchored by the resort’s Sunrise Lodge, which serves as the hub of Bachelor’s snow sports school programs. While we were buffeted by ferocious gusts at the summit, the air was dead calm on the slopes above Sunrise. Novices and children learned to carve turns as park rats played on the features in Bachelor’s entry-level Sands terrain park. Seaside, Cannon Beach, Pacific City and The Point provide a natural progression to the largest of terrain features. That leads to Bachelor’s forté: family skiing. There’s more than enough here to keep a diverse family of snow sliders of all ability levels satisfied for an entire week. That leaves one scratching their head to try to understand where the destination visitors are; that is, until your eyes scan the base area without a condo in sight.